(SP) – Walmart has made a formal request to Michigan head football coach Jim Harbaugh, asking him to no longer publicly state that he wears khakis from the retail giant. The corporation e-mailed Harbaugh and Michigan’s president in the waning moments of the team’s blowout loss to Penn State — all but clinching another also-ran season for the Wolverines under Harbaugh in the Big 10 — and said a certified letter would be delivered to the coach on Monday. 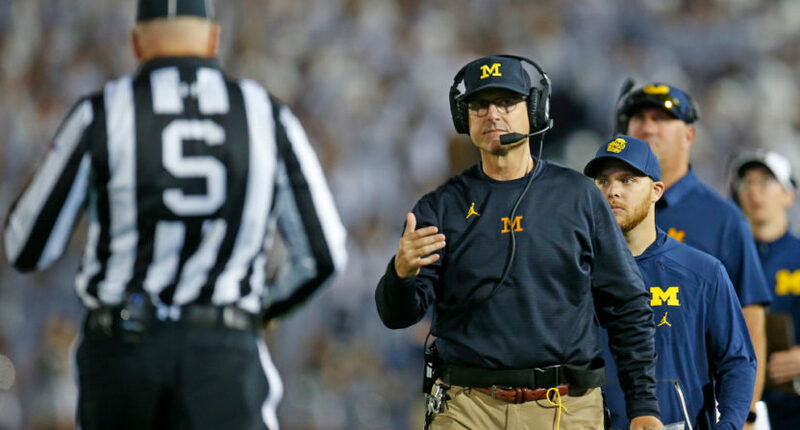 Without his Walmart khakis, it is unclear what Harbaugh will wear at Michigan’s next game. But sources close to the program are saying it will likely be something without Michigan branding. “Let’s just say there’s probably not a good reason to give him a lot of Michigan stuff, when there’s a chance he’ll just have to turn it back in in a few months, if you know what I mean,” said one athletic department source.